Ed, do you have any information on the Hamilton Beach 04383 Allergen Reducing Air Cleaner? The sales info says that filters can be cleaned and never need replacing. I am also wondering about the performance as compared to the older HB (Hamilton Beach 04163) on your site. The inexpensive Hamilton Beach 04383 Allergen Reducing Air Cleaner, from small appliance maker Hamilton Beach/Proctor-Silex, Inc, is very properly named. It is a desktop dust collector, which "reduces" allergens. "Air cleaner" is used on my site to denote sub-HEPA low quality, so the marketers nailed it. At least the company didn't directly mislead buyers by claiming the product is something it isn't. This air cleaner is targeted exclusively at very naive first-time buyers. If you read my home page, about halfway down you'll see a section under the headline “What you can’t see does hurt you," describing the "dirty little secret" of the air cleaner business, and a bit about buyers being fooled by machines which collect only large visible dust in the 5 to 50 micron size class. Hamilton's 04383 is a three-micron air cleaner, it performs in vacuum cleaner, not air purifier, territory. Despite obfuscatory language designed to fool first time buyers ("High-performance HEPA filter captures 99% of dander and airborne particles as small as 3 microns") 04383 is nowhere close to being a HEPA air purifier. The package and promotional materials say right up front "particles as small as 3 microns." Hey - why make a fuss over a missing decimal point? My point here is not to disparage a best selling product, but to inform buyers as to what Hamilton Beach 04383 and its variants can and cannot do. Amazon.com has over 1,500 customer reviews, indicating sales success. The majority are very positive, averaging 4.2 stars, but are written by folks who mostly admit it's their first air cleaner. Hamilton 04383's permanent filter "never needs to be replaced," just vacuum maybe four times a year. As was the case with now discredited former best-seller Sharper Image Ionic Breeze, many users marvel at "all the dust" they find at filter vacuuming time. Again, you absolutely cannot see the .3 micron particulate real air purifiers capture. The "permanent" label belies the filter's inexpensive, fragile construction (very thin cardboard). Replacement filters, part number 990051000, run about $17 at the company website, and are sold at amazon in some volume, so lots of users are in fact needing to replace them. 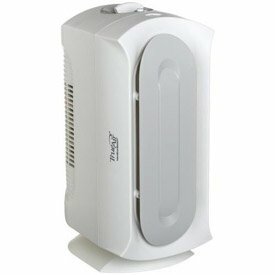 Low priced air cleaners in general have very thin support, and Hamilton 04383 is no exception. The 04383 doesn't have a pre-filter. Some buyers have been mislead into thinking they were buying an ionizer-equipped air cleaner by vendors displaying photos of Hamilton's sister product, the Hamilton Beach 04385 "True Air Glow Allergen Reducer." But there is no ionizer on 04383, which is for the better as ionizers in this price class are often ozone and nitrogen oxide prone. Rating this 60 cubic foot per minute fan for 160 square feet makes sense if only dust collecting is the sole goal. The machine is small - 8-1/2 by 6 by 13-1/2 inches - and weighs just over 4 pounds. Users report the 3 speed fan is quiet in Whisper Mode and louder in Quick Clean mode. Variable build quality on all air cleaners in this rock-bottom price range means that sound levels will vary from machine to machine. This is largely due to out of balance fans. The now-discontinued Hamilton Beach 04163, which you mention, was, while still a budget air cleaner, a more powerful and higher quality machine. I estimated its CADR at a respectable 230. With its 60 cfm fan, the little 04383 would score a CADR of about 50, if it could catch the test particles, which it can't. Many user reviews report some relief from pet allergies. Others are certain their Hamilton air cleaner reduces odors - it removes airborne particles only, not odors, gases, or chemicals. Hamilton Beach 04383 Allergen Reducing Air Cleaner inhabits the rock bottom price range for air cleaners, so we shouldn't expect premium class performance or install the small air cleaner in large rooms. 04383 may help shoppers on tight budgets with large particle allergy, (seasonal pollens, mold spores, and large house dust). For those wanting to keep dust out of their personal computer and off the desktop, HB 04383 can work when set-up nearby. Hamilton Beach 04383 at Amazon.com.